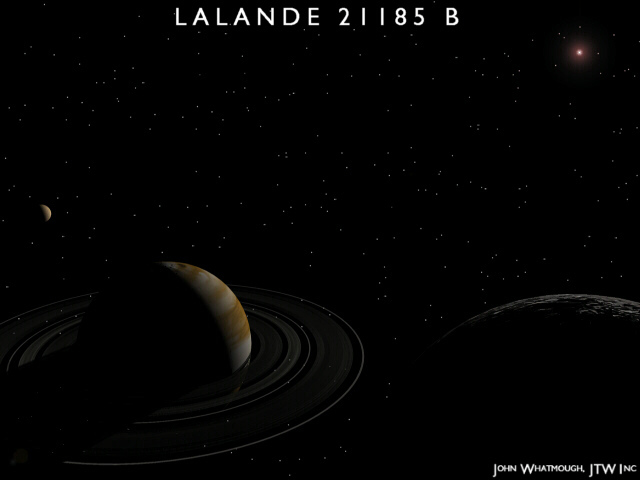 Lalande 21185 is the fourth system closest to Sol after Alpha Centauri 3, Barnard's Star, and Wolf 359. The star is located only about 8.3 light-years away in the southeastern corner (11:03:20.19+35:58:11.55, ICRS 2000.0) of Constellation Ursa Major, the Great Bear which also encompasses the Big Dipper -- northwest of Alula Borealis (Nu Ursae Majoris). It is about three times too faint to be seen with the naked eye. The star was first listed by Joseph-Jérôme Lefrançais de Lalande (1732-1807), who became director of the Paris Observatory in 1795, produced the most comprehensive catalog for his time of 47,390 star positions (the Histoire Céleste Française) in 1801, and was actually the first person to add Flamsteed numbers to designate the brighter stars within each constellation in a French edition of John Flamsteed's (1645-1719) star catalog. In 1996, astronomers reported the detection of possible planetary companions for Lalande 21185 using astrometric measurements -- details below. Due to Lalande 21185's proximity to Sol, the star has been an object of intense interest among astronomers. It was selected as a "Tier 1" target star for NASA's optical Space Interferometry Mission (SIM) to detect a planet as small as three Earth-masses within two AUs of its host star (and so some summary system information and images of Lalande 21185 may still be available from the SIM Teams), but the SIM project manager announced on November 8, 2010 that the mission was indefinitely postponed due to withdrawal of NASA funding. Astronomers are also hoping to use the ESA's Darwin group of infrared interferometers to analyze the atmospheres of any rocky planet found in the "habitable zone" (HZ) around Lalande 21185 for evidence of Earth-type life (Lisa Kaltenegger, 2005). This cool and dim, main sequence red dwarf (M2.1 Vne) has 46 to 55 percent of Sol's mass (RECONS estimate; and NASA Star and Exoplanet Database, based on Henry and McCarthy, 1993), 34 to 46 percent of its diameter (NASA Star and Exoplanet Database, based on Kenneth R. Lang, 1980; and Johnson and Wright, 1983, page 671), but less than 6/1,000th of its visual brightness and two percent of its bolometric luminosity (NASA Star and Exoplanet Database, based on Kenneth R. Lang, 1980). The star is less enriched in elements heavier than hydrogen ("metals") compared to our Sun, with around 63 percent of Sol's abundance of iron (Cayrel de Strobel et al, 1991, page 292). 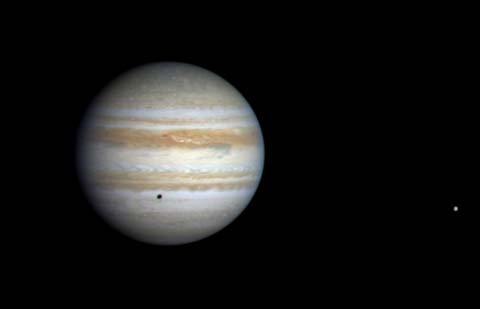 It is suspected to have at least one, but perhaps as many as three, Jupiter-class planets. flaring suddenly again after several hours. 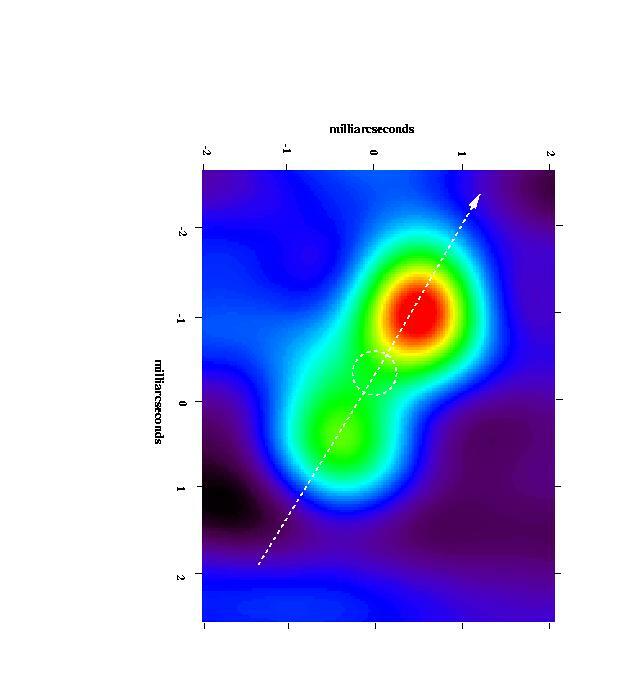 Moving perpendicular to the galactic plane at a fast velocity of 47 km/sec, Lalande 21185 appears to belong to the our Milky Way galaxy's "thick disk," which has a mean thickness of 3,500 ly. 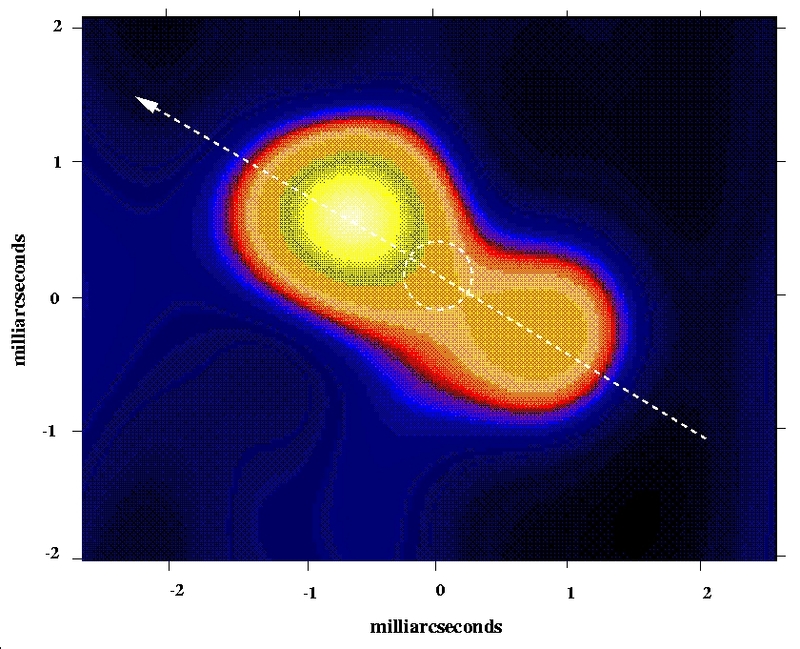 Most thick disk stars are old and move rapidly within 5,000 ly of the galactic plane in considerably eccentric orbits. Their abundance of elements heavier than hydrogen ("metals") typically ranges from 0.2 to 0.5 of Sol's (with a mean of 0.3). Thick disk stars may comprise as much as four percent of nearby stars (Ken Croswell, 1995, page 62). According to SIMBAD, Lalande 21185 is also considered to be a flare star. Hence, while probably much older than our own 4.6-billion-year-old Sun, Lalande 21185 is probably less than 10 billion years old. Some alternative names and useful star catalogue numbers are: Gl 411, Hip 54035, HD 95735, BD+36 2147, SAO 62377, LHS 37, LTT 12960, LFT 756, Vys/McC 594, G 119-52, G 147-17, GC 15183, and Lal 21185. According to one type of model calculations performed for the NASA Star and Exoplanet Database, the inner edge of Barnard's habitable zone should be located a little closer to the star, at around 0.139 AU from the star, while the outer edge lies around 0.272 AUs. Accounting for the great infrared output of M-stars like Lalande 21185, the equivalent orbital distance for an Earth-type planet would be around 0.22 AUs (Lisa Kaltenegger, 2005, page 48). At a little over half of Mercury's distance in the Solar System, however, the rotation of the planet could become tidally locked with the star so that one side would have perpetual daylight with the other in darkness. Assuming that Lalande 21185 does have 46 percent of Sol's mass, a small Earth-type rocky planet would complete its orbit the star in less than 56 days. 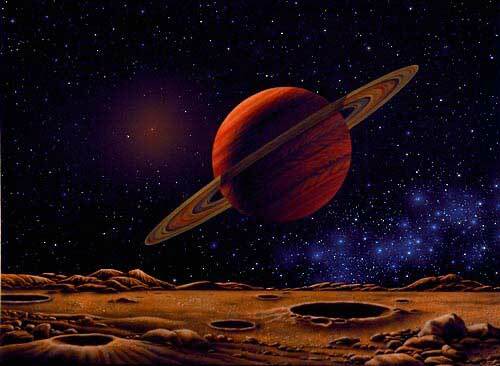 In 1996, a team led by George G. Gatewood (director of the University of Pittsburgh's Allegheny Observatory) reported the detection of possible planetary companions for Lalande 21185 (Gatewood, 1996). This apparent planetary system was detected from astrometric perturbation analysis of photographic plate data collected from 1930 to 1984 and from tracking the star's motion from 1988 to the present using a Multichannel Astrometric Photometer. However, the planetary detections could not be confirmed using radial velocity measurements (see Gl 411 in Henry et al, 2000). cratered moon, as imagined by Cook. Planet "b"?- Closest to Lalande 21185, planetary candidate ("b") may lie within 2.2 times the Earth-Sun distance (AU) to the star -- around the inner boundary of the main asteroid belt in the Solar System. 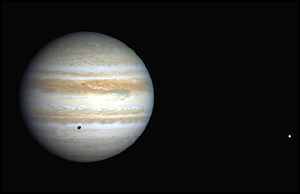 It has about nine tenths of Jupiter's mass, a highly circular orbit (e~0.0), and a period of 5.8 years. and moons, as imagined by Whatmough. Planet "c"?- The second planet ("c") may lie about 11 AUs away in the first planet's orbital plane, with perhaps 1.6 Jupiter masses, a highly circular orbit (e~0), and a period of 30 years. 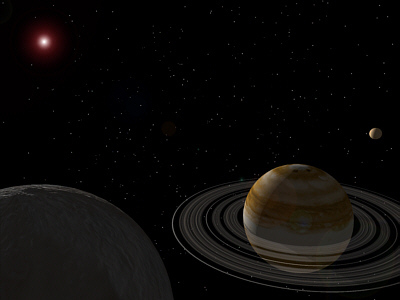 In September of 2002, a team of astronomers (including Cristiano Cosmovici of the Institute for Cosmic and Planetary Science) announced at the Second European Workshop on Exo/Astrobiology that they had detected water "maser" emissions from three of 17 star systems suspected of hosting planets, including Lalande 21185, using the 32-meter Medicina radio telescope near Bologna. 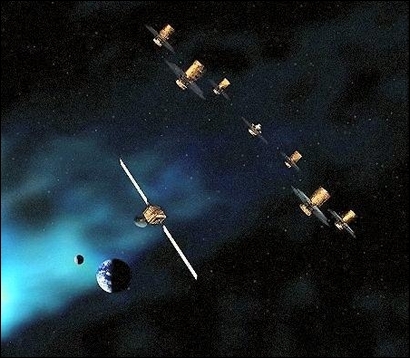 These microwave emissions could be generated from water molecules in a planet's atmosphere when they are excited by the infrared light of its host star. In an interview with New Scientist magazine, Astronomer Hugh Jones (Liverpool John Moores University) noted that the water signals could be coming from the host star rather than from a planetary atmosphere, but that additional telescopic observation should be able to pinpoint the exact source of the signal. Astronomer Geoff Marcy (University of California at Berkeley) added that he would not expect water maser emissions from the planets to be strong enough to be detected from Earth, but noted: "It wouldn't be the first time a surprising result came from extra-Solar planets." The following star systems are located within 10 ly of Lalande 21185. 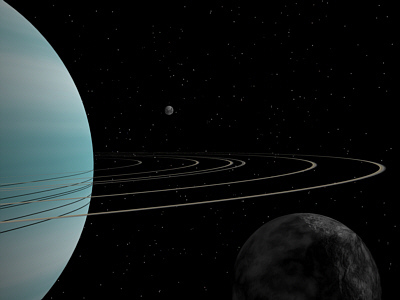 Up-to-date technical information on Lalande 21185 and its planetary candidates can be found at: Jean Schneider's Extrasolar Planets Encyclopaedia, Astronomiches Rechen-Institut at Heidelberg's ARICNS, NASA Star and Exoplanet Database, and the Research Consortium on Nearby Stars (RECONS) list of the 100 Nearest Star Systems. Additional information may be available at Roger Wilcox's Internet Stellar Database. For illustrated discussions of this dim red dwarf and its potential planetary system, see Christoph Kulmann's web page on Lalande 21185 and the late John Whatmough's detailed pages on this system in Extrasolar Visions. Constellation Ursa Major is only visible from the northern hemisphere. The seven stars of the Big Dipper in this constellation are famous as the traveller's guide to the Polaris, the North Star. For more information and an illustration of the constellation and an illustration, go to Christine Kronberg's Ursa Major. For another illustration, see David Haworth's Ursa Major.